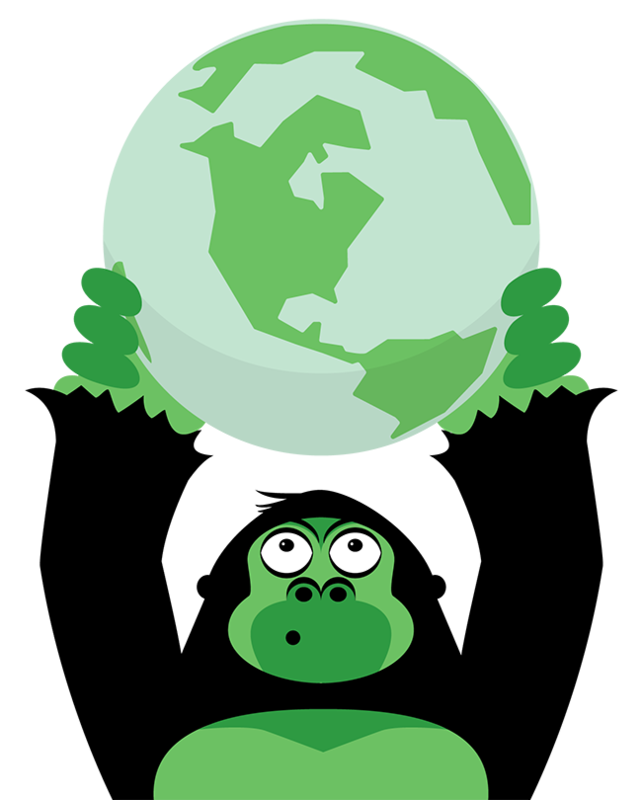 greenApes is a digital platform created with the aim of promoting sustainable practices via the sharing and exchange of sustainable ideas, actions and experiences. Specifically its purpose is to incentivise environmentally friendly behaviours, by also facilitating contacts between stakeholders who care about the planet and providing greater satisfaction to people who contribute to a more sustainable future. The jungle is a public space. • Consider public anything you post to the Jungle and greenApes in general (just like on Twitter). Typically your actions will only be visible to other apes using the apps and accessing the greenApes website, but in some occasions the best green actions will be shared on our website or our social media channels to provide eco-friendly inspiration to a greater audience. You can be an anonymous ape. • Even if the content is public, nobody needs to know who you are. Call yourself “JohnBanana” and nobody will know who you are. We will never reveal your Facebook identity if you don’t want: it’s an ape promise. You are the sole responsible for your conduct and any data, text, information, screen names, graphics, photos, profiles, audio and video clips, links ("Content") that you submit, post, and display on the Service. You must not modify, adapt or hack greenApes or modify another website so as to falsely imply that it is associated with the Service or greenApes. In some regions and/or times of the year, eco-friendly rewards offered by greenApes or its partners might be available, being listed in a dedicated section of the app. Such Rewards are an additional benefit to promote sustainable consumption but shall not be considered a funding element of the Service. The mechanics and conditions to access and claim such rewards, as well as their availability, may vary over time and without warning. We commit to a lawful, safe and transparent process and our best effort for the protection of all the non-public data you provide. The expression “non-public data” refers to all the information you share with greenApes but not make publicly available (e.g. by publishing it on your visible profile or by sharing it explicitly with the users community). You can at anytime request a full copy (in digital format) of your data stored by greenApes during your access to the Service. This right of access implies that you can anytime ask for rectification, integration or cancellation of all your stored personal data. greenApes does NOT claim ANY ownership rights on the text, files, images, photos, video, sounds, musical works, works of authorship, applications, or any other materials (collectively, "Content") that you post on or through the Service. By displaying or publishing ("posting") any Content on or through the Service, you hereby grant to greenApes a non-exclusive, fully paid and royalty-free, worldwide license to use, modify, delete from, add to, publicly perform, publicly display, reproduce and translate such Content, including without limitation distributing part or all of the Site in any media formats through any media channels, for the purpose of operating the Service and promoting it. greenApes does NOT force you to publicly display your real name, reveal your real identity nor your validation account used for registration (e.g. Facebook account, telephone number). While greenApes does record and store internally the association between your greenApes account and your Facebook account for the purpose of operating the service, your public identity on greenApes can be totally anonymous. We will NOT display or reproduce the Content in a way that associates it with your real identity, unless explicitly authorized by you, for instance (but not limited to) using one of the following options available in the Service: (i) you can choose to publicly display your Facebook account (and thus your real identity) as an option in your profile; (ii) you can choose to post your actions on your Facebook diary / wall. The greenApes Services contain Content of greenApes ("greenApes Content"). greenApes Content is protected by copyright, trademark, patent, trade secret and other laws, and greenApes owns and retains all rights in the greenApes Content and the greenApes Services. greenApes hereby grants you a limited, revocable, non-sublicensable license to reproduce and display the greenApes Content (excluding any software code) solely for your personal use in connection with viewing the Site and using the greenApes Services.